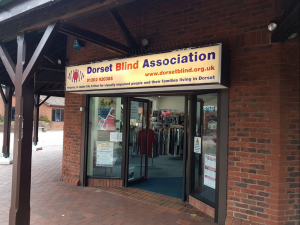 We are currently supporting the Dorset Blind Association Charity Shop. During the month of January 2018 we are happy to accept donations in our Bournemouth Office for their recently opened shop in Ferndown. As usual the Dorset Blind Association charity shop sells a wide range of goods, including accessories, bags, books, clothing, crockery, games, films, jewellery, music, ornaments, paintings, shoes, and toys. Also more unusual items such as sports equipment, musical instruments and home furnishings, are welcomed. If you are unsure, contact the shop staff directly to double check. All money raised in the shop goes directly to the Dorset Blind Association and helps their aim of supporting blind and partially sighted people to live happy lives. As with all charity donations, the main thing to consider is “would someone else want this?”. Broken items, or those missing essential pieces – like jigsaws – cannot be sold. However, all clothing – be it unfashionable, holey or torn – can be used to raise vital funds for the charity. Dorset Blind Association have an arrangement with a textile recycler, who buys any unsold items from them, including bed linen and curtains. Such unsaleable goods will then be recycled, or exported and sold overseas. If you have any items you would like to donate then bring them into the office and we will arrange for their transport to the Ferndown Shop. For further information on the work which the Dorset Blind Association does then see their website or contact them directly.